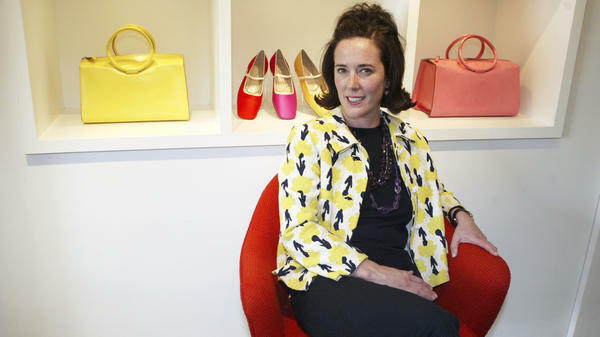 Designer Kate Spade is seen in 2004 among handbags and shoes from her collection. Spade was found dead in her New York City apartment on Tuesday. She was 55. Kate Spade, the designer who built a billion-dollar brand of luxury handbags and accessories, was found dead in her Park Avenue apartment in Manhattan on Tuesday. She was 55. New York Police Department officials said that police received a call around 10:30 a.m. and that officers found Spade unconscious and unresponsive in the bedroom of her Park Avenue apartment. She was pronounced dead at the scene. "It was a suicide," NYPD spokeswoman Arlene Muniz told NPR, without providing further details. The exact cause of Spade's death will be determined by a medical examiner. Spade and her then-boyfriend, Andy Spade, founded Kate Spade New York in 1993 and grew it into an empire that now, according to the company's website, encompasses more than 140 stores in the U.S. and more than 175 stores worldwide. "Our thoughts are with her family at this incredibly heartbreaking time," read a message on the Kate Spade company website. "We honor all the beauty she brought into this world." Kate Spade talked to NPR's How I Built This podcast in October 2016 about the couple's decision to launch a business. "He just said, 'What about handbags?' And I said, 'Honey, you just don't start a handbag company.' And he said, 'Why not? How hard can it be?' " Spade said. Born Katherine Brosnahan in Kansas City, Mo., Spade planned to have a career in journalism despite her penchant for fashion. Those plans took a turn after college in Arizona, when she moved to New York City and got a job in the fashion department of media company Condé Nast. "I started as an assistant," she said. "So I was tying, you know, models' shoes on a photo shoot." Eventually she rose to senior fashion editor at Mademoiselle magazine. But Spade realized there was a hole in the handbag market, and she thought she could fill it. "At the time," Spade told NPR, "bags were too complicated. And I really loved very simple kind of architectural shapes." Even though she had no formal training in designing handbags, she began to do just that. "I did start by buying big sheets of white paper," she said. "And I would cut out and tape, honestly, the shape that I wanted." Then there was the issue of the name. "I was Kate Brosnahan," Spade said. "And I kept coming up with these names. And Andy kept saying 'Kate Spade' because we were 50-50 partners. And finally I just said OK. And everyone said, 'I love it, Kate Spade New York.' "
The company got off to a shaky start, and the couple ran through their savings to keep it afloat. Soon enough, however, magazine editors began featuring the sleek yet playful bags, and big department stores began buying them. In 1999, Neiman Marcus bought 56 percent of the company, which branched out to include things like stationery and shoes. The Spades sold the rest of their shares several years later. Last year, Coach bought Kate Spade for $2.4 billion. Spade told NPR that giving birth to her daughter in 2005 was a big factor in her decision to get out of the business. "It was a perfect time to leave," she said. "I wanted to spend time with my daughter. It was — you've heard so many horror stories about people who sell and then they stay and then they fight and then they sue. And I just thought, that's too ugly for me. So we left on great terms." In 2016, Spade and her husband launched a shoe and handbag company called Frances Valentine. She said starting a new company after the success of Kate Spade New York was a double-edged sword. "I feel a little more confident," Spade said. "But on the same hand, you think that people are expecting a great deal. So there's still a lot of pressure, trust me. And we're self-financing again, so I'm not crazy about, as I mentioned earlier, losing any money (laughter). So, you know, this thing better work." In the 2016 interview, Spade told NPR that people have asked whether she has any regrets. "And I remember thinking, 'Oh, I hope I don't,' and I never have."